The stream was now a shallow width of water running between massive rocks piled on each other like a giant’s stepping-stones. Small branches were often caught between the rocks and necessitated climbing over, around or under in order to proceed. On each side was a short grass area before fernery and larger trees grew on steep banks towering above the three trampers. It was like walking along the base of the letter ‘V’. “Come on!” yelled Cathy. She was still in front and her nimble frame found the going easier than the two adults behind her. She leaped down one more rock and stopped. The stream had gone! In front was nothing but the sky above a hillside of thick bush across another steep valley. Cathy stepped forward for a better view when a small rock beneath the foot she’d just transferred her weight to, moved. She screamed and attempted to throw her weight backwards. Partially successful, she landed on her buttocks and skidded downwards. Desperate arms swung out, grabbed an overhanging branch and held on. Cathy stared down and gasped. The stream had become a waterfall. There was nothing below except a small sloping ledge and a vertical plunge into the depths below. “Help me!” she screamed as her arms began to ache and the grip on the branch slipped. She skidded three meters downwards over vegetation. With a rush of tumbling stones that bounced forward into the void she was propelled sideways and managed to land across a tree trunk that stuck out from the bank. She gasped and grabbed a branch above her with both hands. Her forward momentum was stopped but she found herself suspended above a waterfall. As soon as he heard Cathy scream, Steve rushed forward. In three almighty bounds, he was at the position where she had slipped and saw her head disappear below as screams rent the air. “Oh my God!” Lavina gasped from behind. He slipped his backpack off, handed it back to Lavina and studied the immediate surrounds. Wide eyes fixed on him. “Yes Steve.” The voice was a little calmer. “My arms are aching. Cathy looked terrified but managed to slide herself forward along the branch that she sat on. “I’m near the bank but there’s nowhere to go,” she sobbed. He watched as the youngster sucked air in, held it and blew out. This had a calming effect and her shaking body returned to normal. “Steve!” Lavina gasped and he looked up. Her face portrayed an inner turmoil almost as frantic as her daughter’s. Lavina nodded and edged closer as Steve turned and let himself down. “Tell me when my feet are inside where the tree grows out of the bank,” he called down to Cathy. It was only when he arrived near her, that Cathy lost her nerve. He stretched out until his hand reached her closest one. She stared at him, let the branch she was holding go with one hand and almost lost her balance. He grabbed her hand and pulled her in. She was dead weight and her hand slippery but he couldn’t let go. With one arm wedged around the tree he was secure but Cathy was still suspended above the sheer drop. Cathy stared at him, swallowed and sort of launched herself forward with a plaintiff cry. She flung her arms around his neck and was, for a second, hanging over empty space with her legs dangling beside the branch. Steve swung his free arm around and gripped her waist. She was slipping! Cathy held him so tightly he almost choked but she managed to get one foot to the branch. It took her weight and Steve pulled her in. Steve could feel the youngster shaking in his arms and see her wide eyes and blood drained face staring at him. Steve held her waist and gave the surprisingly heavy girl a shove up. She placed one foot behind another small tree trunk, used Steve’s cupped hand as a support, and then his shoulder. She glanced down and froze. Cathy’s chin was shaking so hard she could barely speak. Her foot reached the rock wedge but there was not enough momentum for her body to follow. Her balance was almost lost and she uttered a terrified scream. Steve grabbed her buttocks and heaved her up. 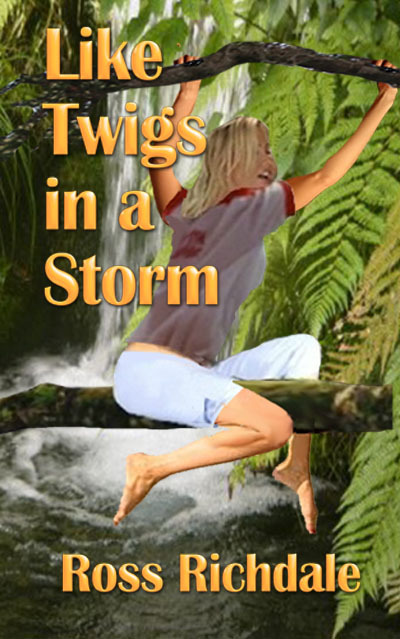 Cathy reached out with her arms, found a clump of grass and pulled. Her second leg reached the wedge behind the tree branch and she pulled herself into the cliff. Perspiration rolled down her neck and body but she was secure. “There’s nothing to hold on to!” Cathy whimpered. Cathy could be seen holding her breath, mentally counting and breathing out and it seemed to work. Then she reached out, found a handhold, stepped up and grabbed her mother’s hand.